Limited Edition "Iced Tease" Hand-Painted Cel by Chuck Jones. Released in 1998, this 350 piece edition had been hand-signed by Chuck Jones. Unframed, the cel measures roughly 12.5 wide by 10.5 high. Comes with its original Studio Certificate of Authenticity. Having assisted both seasoned and novice art collectors since 1993, Barker Animation has remained one of the most trusted and preferred sources for animation and pop culture artwork in the world. Authorized and approved by more than 20 production / publication studios, all offered artwork comes directly from the studio in question and arrives with the original Studio Certificate of Authenticity (if applicable). With thousands of originals, limited editions, and collectibles to choose from - it's no wonder why 13,000 collectors from 15 different countries proudly display artwork from Barker Animation in their homes and offices. Edition numbers vary, and may differ from what is pictured. Any apparent imperfections are a result of photography only. 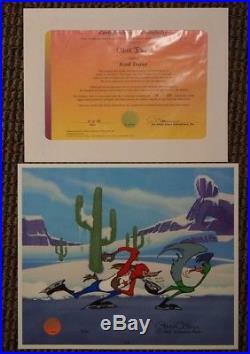 The item "S/O Iced Tease Ltd Ed Cel SIGNED Chuck Jones The Roadrunner Wile E.
Coyote" is in sale since Wednesday, May 30, 2018. This item is in the category "Collectibles\Animation Art & Characters\Animation Art\Limited Editions". The seller is "smallamazon" and is located in Cheshire, Connecticut.